Perhaps you have been wondering what happened to my Winter 2009 Newsletter or the lack of blog posts the last few months. Well, I can finally announce to the world that I have been working on a book on adventure sports photography these last five months. 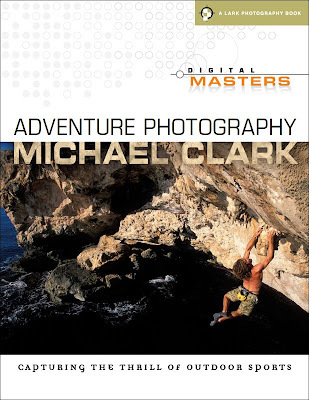 The title of the book is Digital Masters: Adventure Photography and it is part of a series of photography books being published by Lark Books, a division of Sterling Publishing Co., Inc. It is quite an honor to be chosen to write this book as a few of the other authors include Bob Krist, George DeWolfe and Nancy Brown, who are heads of state in their respective genres of photography. This book is a how-to type book which basically details the ins and outs of documenting adventure sports. As far as I can tell there are no other books out there that even come close to covering as much ground as this book does. In fact there are few if any books that specifically talk about shooting adventure sports at all. - Adventure Photography Fundamentals: Light, Autofocus, Histograms, Exposure, Composition, Remote Camera work, etc. - How I approach and shoot the major adventure sports - talking about each sport individually. At the moment, I am finishing up the last chapter and will be finalizing the book in the next week or two. It still has a long ways to go before it hits the bookshelves but it should be out this fall. Of course, I will be advertising the book in my newsletters, on this blog and others. So stay tuned. If you just can't wait and want to be one of the first to get the book this fall it is already up on Amazon.com and is available for pre-order. 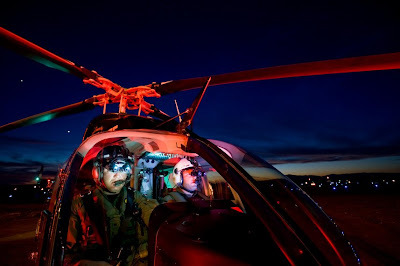 Last fall, I got a call from Men's Fitness magazine to shoot the Sonoma County Sheriff's Department helicopter search and rescue squad known as Henry 1. I have been holding these photos under my hat for months and now that the article is out I thought I'd put up an extended web gallery of images from this assignment. I have to say that this assignment was one of the most fun and exciting assignments I have had in the last year. How often do you get to go fly around with an elite helicopter rescue unit for two full days and have them tell you "whatever you want to do you just let us know." I probably won't have that ever happen again. And I have to say everyone that works on the Henry 1 squad was a rockstar. They know they have one of the coolest jobs on the planet. 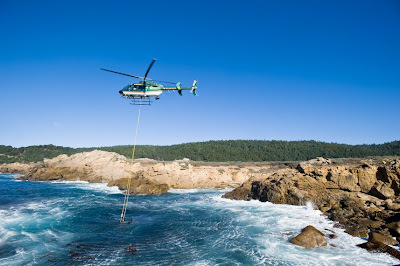 Though the assignment was only two days it felt like a week's worth of helicopter time. We were flying all over the place answering calls and in between shooting training exercises on cliff bands, in the ocean and everywhere in between. I am sure some of the stunts the pilots were executing were quite a bit more dangerous than I knew. At one point Paul Bradley, the pilot with us on the first day of my assignment, slotted the chopper into a hillside with trees above the whirling blades and trees on either side only a few feet away. 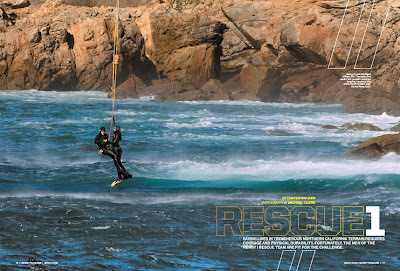 The next day I was hanging a hundred feet below the chopper to shoot a mock rescue. So as you can tell, this wasn't much different than every kids fantasy: to fly in a chopper with pilots who can pretty much do anything! One of the most amazing aspects of this assignment for me was just to see how they work and how incredible their pilots are. When they take off there is no "scenic cruise" mentality. You get about a foot or two off the ground and you are out of there. They turn on a dime and lay that puppy sideways when they need to as you can see in a few of the images. You can check out the web gallery with some of the out takes from this assignment on my website here. And finally, I would be remiss if I didn't say a huge thank you to Lisa Elin at Men's Fitness and the entire Henry 1 crew for being so acomadating and friendly - I had a spectacular time ripping around northern California with you guys! You can check out the Henry 1 website at www.henry1.com. And you can download the article on the Henry 1 site here. I spent the last month in Patagonia, more specifically in Chilean Patagonia - at the very end of the continent, covering the 2009 Wenger Patagonian Adventure Race (and afterwards shooting stock images in Torres del Paine). Let's just say the race was full of carnage. Six people ended up in the hospital. Everyone was ok but some were in danger of losing limbs or even their life. 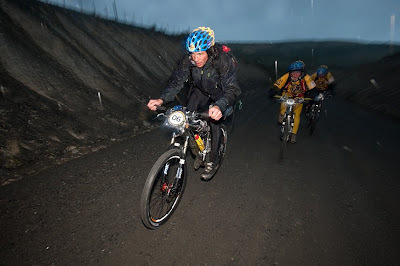 There were some close calls out there, especially in the final trekking section. One photographer even broke his ankle so it was a rough year. And the carnage also extends to the camera gear as well with myself taking the biggest hit. One camera body and one lens took a swim with me in the ocean. It is toast. But thankfully my insurance covers it so I'll have a new one here soon enough. I also have another lens and tripod that will have to be repaired as well. Other photographers had some lenses that will have to be repaired or replaced so I wasn't alone in the equipment carnage category. This years race was the toughest ever. The weather was wet and rainy for the entire 10 days. We did see brief, 5-minute spells of sunshine, a couple of times but they were only cruel teasers and then it was back to sideways rain. There was a lot of sea kayaking, mountain biking and trekking as well as a short rope climbing section in this years race. 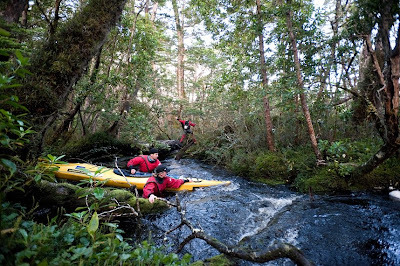 All in all, the first four sections of the race were pretty "casual" compared to the final sea kayaking and trekking sections. Imagine pushing off for an 11-hour sea kayak session across open ocean and into a Fjord with two meter or larger waves. Once you get to the other side, you have to exit your boat and drag it across a 30-km stretch of water soaked and densely forested wilderness, untouched by any humans in at least a century. Once you finish dragging your boat, you get back into it for another 20 km of paddling to the start of the 120-km trekking section, and all of this after five days and 400 km of racing. Sound fun so far? The trekking section was a real killer. 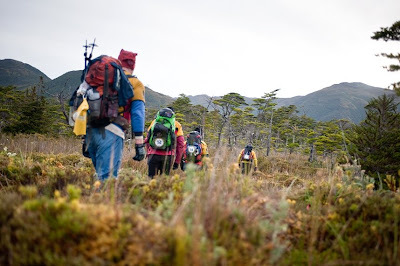 A team of three journalists including Mark Watson, a photographer from Australia, Lydia McDonald, a writer from the US, and myself followed the Canadian team into the trekking section. Our plan was to follow the Canadian team to the top of a pass and wait for the American team behind them. The trekking itself in that first section wasn't too bad. There were the usual suspects: turba, dense forest, high mountain passes -- and oh yeah, lots of rain, even some snow. The Canadian team decided to avoid the dense forest at the start of the trekking and instead climbed straight up a mountain to a ridge. The 1,000-foot ascent consisted of terrain covered by vegetation and in spots we climbed up 65-degree slopes pulling on whatever bushes seemed sturdy enough to hold our weight. Falling would have been a bad option. Even though this route seemed a bit strange as we climbed, in the end it saved us at least 3 hours of serious bushwhacking in the valley below. We were geared up to do the entire trekking section, but not mentally in the same fashion as the teams. The teams that finished spent very little time sleeping. In fact, the British team Helly Hansen - Prunesco, which won the race, slept only 30-minutes in three days! The second place team slept only two hours over a four day period. That was a bit more torture than I was ready for, I admit. Plus we were waiting for the Americans, who never showed up. We later found out they got lost - several times and were barely ever on the recommended course because they chose to try and find shortcuts. They were actually rescued on the last day of the race via helicopter and that in itself is an epic story that you'll hear about soon enough. The wilderness we were walking through was pristine. Imagine a place where nature rules and no human, other than the racers in front of us and the organizers (who checked it out months before), had ever been. It was an inhospitable place. And surprisingly we saw no animals of any kind. Apparently it was a bit too inhospitable even for them. By night fall of the first day we found ourselves in a valley with seven 2,000-foot waterfalls. It was like a little Yosemite - albeit, a very wet Yosemite. After two days in the wilderness completely alone, Marcelo, a guide working for the race organizers, found us in a valley -- that in itself was a miracle. He was told to find us and pull us out in the bay just below us, where we would be ferried to the end of the race. When we got to the bay (which was quite a battle - it took us five hours to go 2 kilometers) there was no boat to pick us up. A small fishing boat just happened to be in an outer bay and they were kind enough to pick us up and let us relax in the dry and warm engine room until our boat arrived. We were met with fresh baked bread and coffee. It was rough I tell you! Our boat never came so the next day they even dove for sea urchins and king crab. We enjoyed a lunch of sea urchin sandwiches and fresh king crab. Race? What race? We were living high on the hog! Well, I could go on and on but I think I'll cut this blog post short here. This year was even better than last year I have to say. The race organizers did a fantastic job. My thanks to them and Wenger for putting on what has to be one of the toughest and most beautiful races anywhere on the planet. As usual, I'll have a much more in-depth article about my adventures covering the race in my next newsletter. If you'd like to see some of the images I have portfolios from the race on my website which you can view by clicking here and here. For more in-depth reporting on the race visit Rob Howard's website Sleep Monsters. His posts, which were published every other day during the race are quite funny and very interesting.